Can Rogaine Be Used on Healthy Hair? Rogaine (generic name minoxidil) can be used on healthy hair because the interaction with hair follicles is to rejuvenate them, not shrink them. The oral version of minoxidil was originally developed to treat high blood pressure, with increased hair growth found as a side effect. A topical formula was made that has been used with some success to treat male pattern baldness. The use of Rogaine on healthy hair should be tempered by restraint due to the cost of the product and possible side effects. If no treatment is necessary for healthy hair, the risk for skin irritation, dryness of the scalp and dandruff formation increases. Although the exact reason Rogaine works isn't known, it is known that the formula increases blood flow to the hair follicles. There is speculation that this, in turn, opens potassium channels to the follicles that regulate hair size and growth. Rogaine is available in a regular 2 percent solution and an extra-strength 5 percent formula. 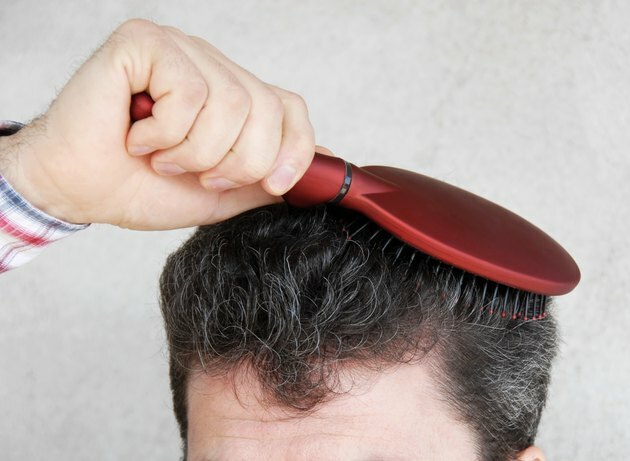 Users of the regular-strength solution report 30 percent to 40 percent success with re-growth of hair; extra-strength solution users report 50 percent to 60 percent success, according to the Hair Transplant Network site started by a hair transplant patient. Similar success rates were published in the Journal of the American Academy of Dermatology. Two applications are applied daily by rubbing some of the solution into the affected areas. It takes about four months to see new growth take place. Rogaine can't cure complete baldness. It stimulates thin hair to thicken and grow in length. Because this action must occur on hair already present, you could say Rogaine only works where there is already some healthy hair. It seems to work a bit better for women than men and will not stop hair loss, only slow the process.